On The Heinemann Podcast today, the need for and needs of teachers of color. "Growth is uncomfortable and all things need to be uncomfortable to grow.” Those are the words of Tiana Silvas, a member of the current class of Heinemann Fellows. She goes on to say in today’s podcast that while conversations about race and privilege are tough and can be uncomfortable, we need to be open to having them, and it's essential to avoid taking these tough conversations personally— in order to do the work and get to a better place. Last week Heinemann opened applications for the third cohort of Heinemann Fellows. The current class initiated a continuing conversation with Heinemann about inclusivity and the need for teachers of color. This conversation touches on many topics, but one consistent thread is why it is so important for educators of color to be included, what that looks like, and why it’s important for teachers of color to be offered space and opportunities for mentorship. Our conversation took place towards the end of NCTE 2017 in St. Louis, shortly after The Heinemann Fellows presented. Joining in our talk are Tricia Ebarvia, Aeriale Johnson, Anna Osborn, and Tiana Silvas. Tiana begins our conversation on the importance of space. See below for a full transcript of our conversation. 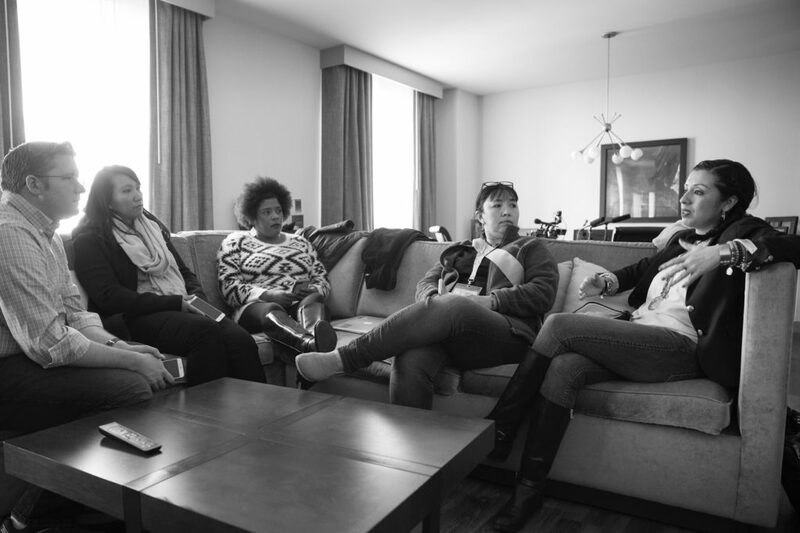 Tiana: I think the five of us have kind of been driven by being able to support each other, but also want support from the external community. It's just full circle that we're feeling here as women of color. We all have our roots from our elders that have gotten us here. I've spoken about how my father, 40 years ago, was fighting at Arizona State University with "El Grupo" to bring teachers of color onboard. And here we are in, what's the year? 2017. We're fighting that same fight and we just think it's really important that our community of educators around us, who we respect and admire their work and have a deep respect for them, help us. Become allies, mentor us, because Paulo Freire says the oppressed have to liberate themselves, the oppressor cannot. And that is why we need allies in going forth in our mission, as we take those steps. Tricia: I think what we've found in this group is that strength that we gather from each other and that I know in this experience of being among these wonderful women is that I've been able to, or more willing to speak up in ways that I wasn't necessarily willing before because I've garnered strength from all of them. And I think that's the way, when you think about our system of education, teachers of color especially are isolated. I'm only one of handful of teachers of color in my entire district. A student once asked me, "how many teachers of color are there?" I'm like, "that's a good question." And we never see each other. We never speak to one another. Issues that teachers of color face in particular are never addressed, so power works by isolating. And when you don't have other people to talk to and to garner to that strength from, then you don't say anything. It's much easier to live in a status quo environment and just "teach the content", when really there's so many other things that we need to be teaching our kids about being good people in the world, and being anti-racist. And I think it's hard to do that when you don't feel like you have either support, or you don't have those connections with others. So I think it's important for our educational community, if we are really on this frontline of social justice to make those spaces for teachers of color, to be able to use their voice, to find each other, to mentor us. Even just acknowledge. Acknowledge and give space and listen, I think. Aeriale: I think the idea of space is so important. This is my twentieth year in the classroom, and prior to this I've taught at schools that didn't have very many teachers of color, maybe one or two others, if any at all. And this year, I am teaching in a school that has predominantly teachers of color, and it's been an empowering, incredible experience for 19 years. I thought I was fighting a war with others because I was a progressive teacher and I was different than they were in that regard, and then I go to a new space where I'm still a little different and do things a little differently, but now my colleagues want to know, "what is that that you're doing in there? That looks great. I'm interested in that." And nothing has changed about me. The thing that's changed about the space that I'm in is that I work with other teachers of color. And so I have a network. I have a support system. I'm working in a space where I'm not a minority anymore and so that makes you have to ask the question, right? Like what was going on for 19 years of my career? I have changed but I also haven't changed, and I'm completely dedicated to children and child-centered education. This is the first time in my career I felt valued. And so how do we create spaces in schools where there aren't a majority of teachers of color where teachers of color feel safe, they feel empowered and they feel as though they're not in a war. They're not in a battle all of the time fighting for children of color and all children, ultimately. Anna: When I think back to my childhood, we've talked about this, I have a very different experience as a student. I had lots of teachers of color, and I was mentored by a lot of my teachers, both my non-teachers of color and my teachers of color. And you know the thing is, is that we plant seeds every day in our classroom, and we're facing an educational crisis. We do not have enough teachers, we do not have enough teachers of color, in many parts of the country. And so I think that, when I think back to being the child of a 19-year-old immigrant and a Native American Cajun woman, I think to myself, if I didn't have my teachers of color, if I didn't have my teachers mentoring me, planting seeds, saying "you have something to offer to our children," then I wouldn't be here today. And so I really think it's about how do we connect with each other because the connection, the threads that we've woven now into a rope that ties us together, has been crucial to the strength we're feeling as fellows. I think that when we're able to talk about race, it's not the elephant in the room anymore. And that's how I feel, is that if we are able to provide a space for a talk, then really magical things are going to happen for our kids. Tiana: Because I think we've given each other courage. There's always been this burning light in all of us, and we've been able to help each other in our respective areas go out and do something, so that it's going beyond just saying and actually doing the groundwork, whatever it may be in our areas. Tricia: Yeah, I think. Speaking of action, one of my favorite sections of our text message thread was, I think there was one morning we were just sharing pictures, this is what I'm doing. And you could see how we had been influenced and encouraged by each other. This is what I'm doing to do this work today and take a picture and here are Anna's kids reading, here are Tiana's kids looking at racism, here are my kids studying compassion. It's just that kind of ... they keep me in check. Like keeping each other in check because it is so much easier depending on your school system and where I am, to just go with the flow. And I think that teachers of color where I am, I teach in a fairly affluent school district, my kids have a lot of power. They socially have a lot of power right now and politically they will as they come of voting age. How are they going to use that power, right? How can we make them more responsible with it? And teachers have power, and publishing companies have power. What do we do with that to make sure that all voices are really heard and valued. I went to a session yesterday where they talked about history, as you know, as we all know, are just a series of stories and some stories have been systematically overlooked, and there are lots of gaps, and that we have to teach students to be the historians who will fill the gaps. And I think we as teachers do that work but I think we as an educational community have to do that work with each other, because I think even in, I look at my pedagogy books, and I'm like, it is just the same people, in many ways, on my shelf. And I'm like who are the voices that I'm listening to? And I think that's just another form of the canon but in educational publishing and I think that is also another issue. Brett: I want to just mention really quickly an important voice that's not here with us, Doctor Kim Parker, and the influential work that she has brought into the Heinemann Fellows and how she has been an important voice among all of you, but also how influential she's been in speaking to Heinemann. I just want to honor her for just a minute to make sure that we've included her. Brett: Please do, please do. Anna: So I started a doc program since joining Fellows and I had that day where I was that lone person of color and we work hard, teachers work hard, so it was a whole day of hard work teaching, and I sat down and I thought today's the day I'm going to quit. And Kim texted me and she said, "Anna, don't quit. We need you." And not quit teaching, but quit the program and so that really made a difference, and being able to know that there are people who are going to tell us, "don't quit" is just so important. Brett: As we're having this conversation, we're all encouraging educators of color to apply for the Heinemann Fellowship program, but as you all have very beautifully said, in their own schools there are mentorship programs, there are things that they should be doing. Don't quit, don't give up, but is there something educators of color, or someone who can help amplify an educator of color, or bring them along, or do something to help if you're not an educator of color, but you have any form of power that you can do something, or you have any form of privilege and you can help. What is something that we can give people that they can do? Anna: I think we need to plant seeds for the teachers of the future. I think that if we are in 2017, and we have a shortage of teachers in some parts of the country, and definitely a shortage of teachers of color, we need to remember that we're ambassadors for our job every single day. And we need to really inspire the best and the brightest to join us. Tricia: I think, and I think this is an answer maybe that Doctor Kim Parker would give, which is I think that whether it's your, especially for educators who are not of color, white educators, is to call out. Call out other educators who are making racist statements. I think it's, we've all been in those department rooms, we've been in all those faculty meetings, we've seen what professional development testing, like when we see something, you can be an ally, but when you see something that you know is wrong, when you hear an educator talk about "those kids" in a way that is disparaging and dehumanizing, you call it out. And it's not enough for the teachers of color in the room to say, "that's not right." By being a person of color, it's like oh well that's just because it's your issue. But it needs to be a universal call to action. Again, people need to use their power to call out those who might not even know, or not even see. That's the thing. I do believe, I really believe that most educators are really trying their best and they're trying to do what's right for kids. But they don't see it, and so those allies who do see it, they need to speak up. If that means they have to sacrifice or they have to put their relationships with their colleagues in an uncomfortable position, then that's what they have to be willing to do because kids depend on it. If they can say that stuff outside of the classroom, it is coming across in their teaching. It just is. Aeriale: I also think not just as overtly racist things that we see, I think there's covert racism out there in the world. Think microaggressions, all those sorts of things, it's important to call out as well. This year I was given 30 books by my school district to read to my students. Five of those books had people of color in them. One of them had people of color that make up the majority of the students that I teach. My school is 97% Latinx and one of those 30 books, one of those 30 books, had Latinx people in them. And how long has that been going on? This is my first year there. I had to be the one to call it out. Why? What're you thinking? There's nothing about that that is acceptable or appropriate for children. And so I think it's really important that allies keep their eyes open all of the time and I think also part of that is relationships, right? Making sure that you are deepening your relationships with people of color, because that's the only way that you are going to wake up, right? The reason that I'm awake as an ally of the LGBT community is because of the deep relationships that I've established with people who are LGBT. So when something happens, I see it and I know it in ways that I wouldn't have known it prior to those relationships, and I'm able to call those things out so it's not enough to stay in your white community, and your white world, and scream out, be the white liberal who screams out against racism whilst having no people of color in your life. That's not going to work because you don't know, and you can't know unless you have compassion. You carry that burden, and we don't carry burdens that aren't ours. They become yours when you build relationships with those people who are not like you, so that's what I would add to it. Tiana: But Aeriale, we were talking about compassion on the floor. Tiana: At NTT, and we said it's no longer empathy. Tiana: And we were saying that it's compassion, and we looked up the roots of compassion, and remind me of the roots of compassion. Aeriale: It's to bear the burden, right? To carry the weight, to lay down your life. Tiana: To lay your life down for another person, and I mean that since that's what we're asking, is the allies that your heart's in it, that the compassion's there. To wake up, it's going to be uncomfortable, but all things have to be uncomfortable to grow. Growth is uncomfortable. It has to happen and we need compassion. We need a lot of compassion around us. For the kids. Aeriale: Yes. That's ultimately what it's all about, right? It's for all of the kids. For all of the kids. We're all better together. Brett: I think I struggle with trying to figure out the difference between compassion and empathy. How do I figure out the difference between compassion and empathy? Tiana: I think that's an excellent question. This is what we're kind of wrestling with. I think empathy is feeling for somebody, but compassion is the action behind that feeling. Tiana: And doing something like, are you willing to give up something? Are you willing to put your life down? And I don't mean like physically life or death. Tiana: But what about your life are you willing to give up in your comfort zone, for the greater humanity of this world, and peace. And if we think about all the social justice leaders that have come before us, they've lived with complete compassion for their people. Tricia: If you think about the word "co-". It's a togetherness that is different than just feeling. Tiana: The feeling may spark the fire but what keeps the fire going is the movement of the wind. That's what keeps it. Brett: And Tricia, you said speaking up, saying no, that when a comment is made, when something horrible, just standing up and saying no. Tricia: We see this all the time, practicing rehearsal with kids. Saying "That's not cool. You can't say that. That's not appropriate" or, "that's a terrible thing to say." Brett: So it's getting in there and doing the work. Tiana: And being open to conversations, because these conversations are tough. It can be uncomfortable, and like I said, we've been uncomfortable our entire life. And I feel like compassion is letting us have that conversation without taking it personal. Aeriale: That's a tough one. Tiana: And being open. I'm not ... I'm not doing this to make you feel bad. I'm just doing this so we can work to get to a better place because not seeing it is the problem, and not being living in the community or living within that skin, it's hard to understand that perspective. So let's work together, and let me call you out in a productive, loving way, as colleagues and let's go to a better place here. Anna: I think it's about being authentic for us, being authentic to ourselves because we've all been in positions where it's easier to be quiet, and not have the race conversation and that the truth is, is that the hard work of teaching will keep us very busy, and that is something that we very often will put on the side. But I think that since we've started this work, I think we're all much more comfortable about bringing our identities into our classroom, and celebrating it. Brett: I feel like by not having the race conversation, you're just putting it off. Anna: I think that if you're not having race conversation, we're not doing justice to ourselves as teachers of color. Aeriale: Or to the children. Anna: Or to our children. Aeriale: It's a very colorful space, and we've talked a lot about our experiences navigating white space and, if we're honest, education is a white space. So I think what we want to talk about is how do we get to the point where we're not in power just in our space of color, and then we join hands and walk into the white space. How do we make this space of education a space for everyone? For everyone, the whole spectrum, all the colors. Let's stop having all the black kids sit at the same lunch table together. I've even seen that in professional development when we were at Boothbay together last summer, and Zara was there with us as well. It's like, every day we found ourselves together in our own little space of color because it was such a white space and we were feeling, you know, well you can cut this out but, we were feeling a little uncomfortable with the space, not because we don't know how to navigate white space. Obviously, that's how we got here, but because we felt like it shouldn't be that way. It shouldn't look like that. Tricia: Look to see if there's another person of color in the room. Aeriale: Exactly, our first Heinemann Fellows meeting in Portsmouth, Kim and I just kind of stared at each other the first night, and then the next morning I broke the ice. I just walked up to her and I said, "I'm so glad you're here." I don't think either one of us really knew how it felt to be in an elite space like this and not have to be the sole representative of our community, of our people. It changes everything. I didn't even know what it felt like to not have that burden, and now I feel so free. Brett: You said something that, navigating white space. Talk to me about that. Tell me about that. Anna: "I've never thought of you as Filipino or Native American. I don't think that." Tricia: "I forgot you were a person of color." Anna: It hurts because it's such a big part of who I am, and the teachers I had as a child encouraged me and they taught me how to navigate the space. If it weren't for my teachers of color, I wouldn't have known which box to check on the scholarship application. I wouldn't have known how to write about it in a way that benefited me throughout my life. Tricia: I think colonization works in a lot of ways. It's mental, primarily. I think that even for myself, being oftentimes the only person of color in whatever space I've usually been in, I've learned to, but it's like that white-adjacency. I have learned to navigate that space and to kind of be white in many different kinds of ways. That's our border identity right there. Especially for Asian-Americans, there is a white-adjacency kind of issue. And I fully own my part in that in not speaking. I think for myself, I think the reason that my colleagues might not think of me as a person of color, is because I don't bring issues up that are part of that cultural identity. And so I allow them to be erased and I don't talk about them. But they don't also invite those conversations either so I think it's this very complicated thing where I shouldn't have to but yet you're never fully whole in the space, so I think that's what ends up happening. And I'm not saying this to feel bad about myself, and it's not about that but I do think that part of it is knowing that I, and it started as young a child, like my brother and I were the only kids of color in our school and it was just erasing that. Not talking about what happens at home, not wanting your culture to be tokenized, you don't talk about it all. Tricia: Yeah, I bear responsibility for that. Aeriale: We bear a huge responsibility. My grandmother, whom I love with every bit of my heart and who just passed away last December, would always tell me when I went to go visit a white friend, "white people are looking at you. Cover your head when you go to bed because when you wake up in the morning your hair is crazy and white people don't want to see that." So Wanda Sykes makes a joke about that. It's a common thread in communities of color. White people are looking at you, white people are looking at you. It's to the extent that I'll go into, I don't know, an airplane bathroom and it's a disaster in there but I know that I was the last person in there and I will clean it up. I will clean that bathroom so nobody thinks that I made that mess because I am representing my people, right? So yeah, it's be articulate in that space, don't be too loud, don't eat too much chicken or watermelon, you know what I'm saying? Like don't do things that are going to perpetuate stereotypes that already exist about your people, be another story. And part of those stereotypes exist because some of them are true, right, and so to not have to embody parts of who I, or to not be able to embody parts of who I am in a white space in order to not perpetuate stereotypes, it's like this burden that I always carry. Anna: And there's the flip side of that too. The flip side of having to speak two languages. When you're at school, you're going to have to be that person. Yeah, absolutely. But when you're home, or with friends that you've grown up with, don't take yourself too seriously and act too white. Tiana: I thought it was interesting, this summer I think I was just full of rage this summer. Just rage, and I go back home to Phoenix and I'm with my own, and I do that on purpose, to stay grounded with my people, and my father and I had this conversation and he's like, "the Chicana in you is finally rising" and he's like, "I've been waiting for this. I've been waiting for you and your brother to finally rise as the Chicanos and the Chicanas that you are." And Gloria Anzaldúa talks about this, about the juggling and straddling of both cultures. She talks about how we learn to tolerate inconsistencies and confusion, and this hybrid identity develops. With that comes power, the real mestiza comes out. And I felt like, for the first time, and I'm 35 now, I was finally empowered for that. But we had to navigate, I've been navigating that space. From the time growing up to going to private colleges and universities, and then different aspects of my work life, it's just that navigation of going back and forth, back and forth, back and forth, the code-switching. But I think, most recently, being able to be me and I think that there's something magical about that but I don't think I would've had that confidence without this. Aeriale: Nor would I have had it without all of you. Aeriale: I wrote about it, right? To Tiana, With Love. I mean, I literally felt like my whole teacher soul opened up by spending one day in Tiana's classroom, because she stood in front of her children and I saw myself for the first, because I've been working with white teachers for so long. And that's when I realized how much my identity as a person of color, as a person who has been through some things related to being a person of color, related to being a person who was raised in poverty, all of those things impact my teacher identity in ways I wasn't even aware of until I saw Tiana teaching. It was like that ugly duckling moment, right. Like, "oh I'm a swan. Oh my gosh, I'm a black swan, I'm beautiful," so yeah. And it's so interesting to me the common threads that exist between all of us even though we're not the same, right? Tricia: I think that's important too, I think people of color are also not all the same. So I think having a diverse group among the Heinemann Fellows of color is also important because I feel like I've become woke to so many issues relating to other communities because of these women here. And you were speaking about that compassion comes from being deeply invested in that relationship with another person and they become your burdens. And then to understand the nuances too among the struggles of different people of color and recognizing also the privileges that each different group and each person carries and those intersections and I don't think that would've been possible if not for this diverse group of teachers of color already. If you'd like to learn more about The Heinemann Fellows, or if you're interested in applying click here for more information.